Here's a great fireplace design that's sure to be a focal point in your home for years to come. Family and guests will find the design intriguing and appealing-with the warmth and beauty of the fire thrust into the room itself with this peninsula design. In addition, our Superior DRT40PFDM Elite Peninsula Top/Rear Vent Combo Fireplace with Split Oak Logs gives you up to 39,000 BTUs of warmth in a see-through design capped off with realistic looking logs. Complete the look of the firebox comes with real-looking masonry and brickwork (optional). 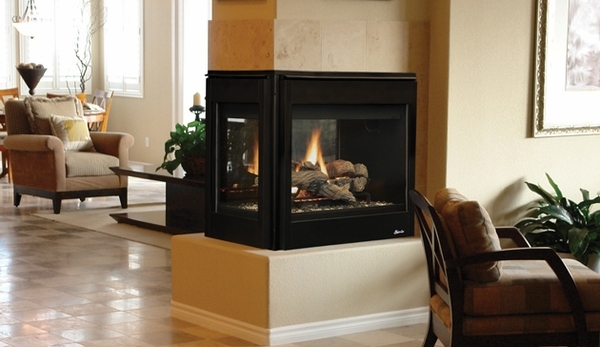 It's easy to operate; check out our optional remote controls and fan systems to fully enjoy your fireplace experience. Can this fireplace be installed with a rear vent and a 90 degree elbow to take the exhaust up and out at the ceiling? This fireplace can indeed support this type of vent installation. The only limitation is that the combined vent length (vertical and horizontal measurements) can be no greater than 40 feet.